Webmaster's Note: John's long awaited book Hawai'i's Sea Creatures is finally available at a very reasonable price from Sea Challengers. For anyone planning a tide pooling or diving holiday in Hawai'i, this book is a must with over 500 invertebrate (including 72 opisthobranchs) species descriptions accompanied by color photos. Terrence M. Gosliner and Rebecca F. Johnson, 1999. 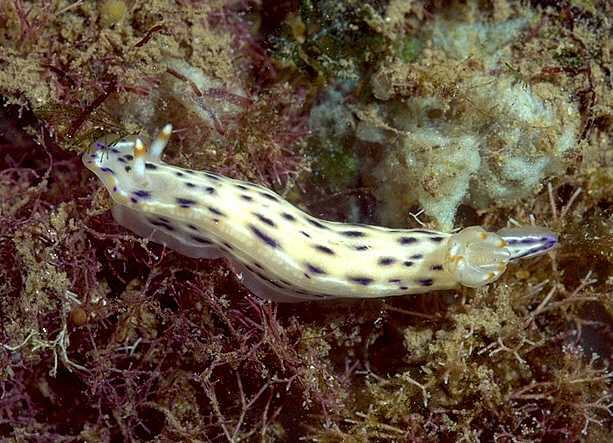 Phylogeny of Hyselodoris (Nudibranchia: Chromodorididae) with a review of the monophyletic clade of Indo-Pacific species, including descriptions of twelve new species. Zool. Journ. Linnean Soc. 125:1-114, with 62 figures. Hans is seen at left with travel and soul mate "stubbs" during a recent field trip to Bahia de Los Angeles in Baja California. 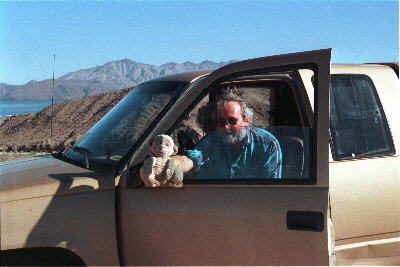 When not teaching at National University, Hans has totally immersed himself in investigating Opisthobranch biodiversity in Baja California since relocating from Hawai'i to the west coast . Having accompanied him many times to LA Bay I can attest to his boundless energy investigating the many marvels of the Opisthobranch world. Accordingly I asked Hans for a short update on his work in Mexico. "...From December 1997 through September 1998, I participated in a research project sponsored by the Mexican federal agency CONABIO (Comisión Nacional para el Conocimiento y Uso de la Biodiversidad). The project was entitled: "Biodiversidad de Moluscos Opistobranquios (Mollusca: Opisthobranchiata), del Pacífico Mexicano: Isla Cedros-Vizcaino e Islas del Golfo de California parte sur." This grant was given to the Universidad Autónoma de Baja California Sur, under the directorship of Carlos Armando Sánchez Ortiz, with myself being named the Investigador Asociado (experto), that is, wow, The Expert Associate Investigator. The field work was completed by myself and colleagues from the UABCS, Orso Angulo and José Luis Arreola. Our project basically had two major emphases: a study of the opisthobranch biodiversity in the area of Punta Eugenia (including Bahía Tortugas and Isla Cedros), and museum data collection. The biodiversity study has already resulted in electronic and journal publications; in preparation is a manuscript detailing 10 species of opisthobranchs that we found (either subtidally or intertidally) which have never before been found from the Pacific coast of the Baja California peninsula. These significant results from just six sampling expeditions have encouraged us to ask for a renewal of the grant. This region obviously needs a longterm biodiversity study. Moreover, our observations and collections were done during an El Niño condition. The museum data collection was a survey of the holdings of California Academy of Sciences, Los Angeles County Natural History Museum, and the Santa Barbara Museum of Natural History. Officially titled "Repatriación de los Datos," we were looking for all Mexican Pacific coast opisthobranch specimens in these museums; we recorded the collecting data of the material, and sent this information to the main files of CONABIO; they now have a data base in Mexico of over 1500 lots of Mexican-collected opisthobranchs that are deposited in the major US Californian museums. We are looking forward to the renewal of our project, and our continued work in the Bahía Tortugas region..."